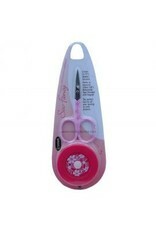 HTL Sew Fancy Set - Pink - Crochet Stores Inc.
Set of pink scissors and measuring tape with magnet. It is the perfect duo for all your sewing projects, with a floral pattern, which makes them look unique. The scissors measure 9.5cm and the measuring tape is 1.50 meters.